Ask a question from the Archive: Visitors often access the read-only discussions in the Archive via an online search. In the past, if this content didn’t answer the visitors’ question (and they weren’t familiar with SAP Community), it was unclear how to proceed with finding more information. Now, we’ve assigned primary tags to the discussions in the Archive* and we’ve added information to these discussions to help visitors find more information and ask new questions. 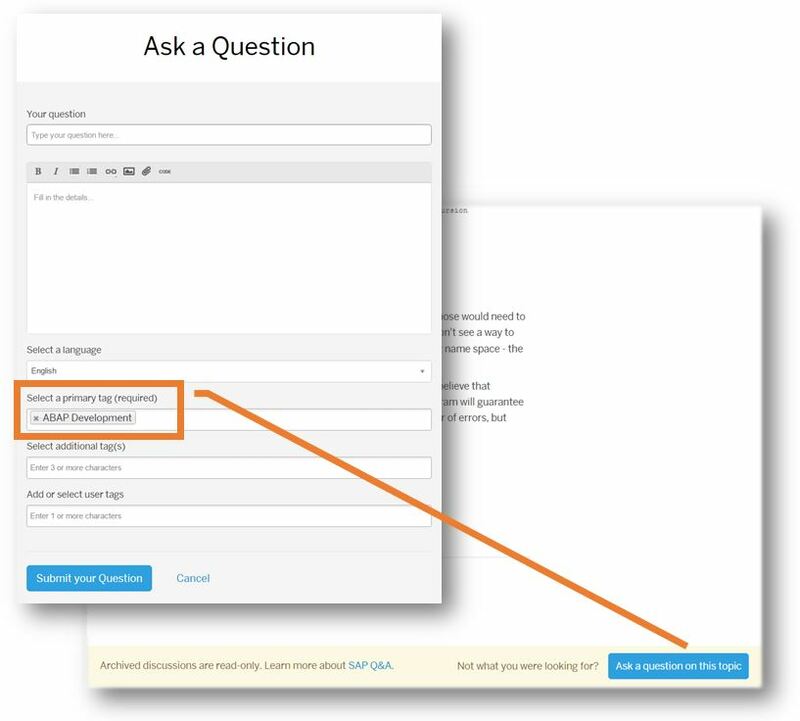 When you click the button to “Ask a New Question on This Topic,” you’ll notice that the Primary Tag field is now pre-populated with the relevant tag. *Note: While the vast majority of the Archive discussions have been assigned a Primary Tag, there are some remaining to be tagged. Clicking the “Ask a Question” link from these un-tagged discussions will take the user to a generic “Ask a Question” form. Clearer notification when users receive a direct message: Previously, you received a notification when you had received a direct message, which included a link on the sender’s name. The link brought you to the messaging application, but many users found this link’s location in the notification confusing. As in other parts of the Community, they expected to visit a person’s profile when clicking their name. Now, the notification includes a “new message” link that opens the actual direct message, and the hyperlink on the sender’s name goes to the person’s profile. 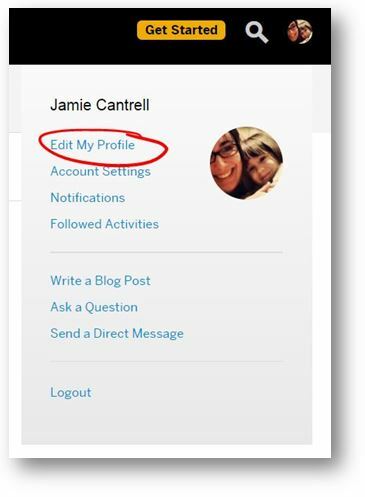 New “Edit My Profile” option in avatar dropdown: Before this release, you would need to click on your photo or name from your avatar drop down menu to view or edit your profile. To make things more intuitive, we’ve added an “Edit My Profile” link to the top of that menu. Note: This link leads to your private view of your profile, which you can edit and see additional information over your public view. To see what’s visible to other members, click on your user name from your private view. These features join the other developments delivered last month. To learn more about all recent releases, please visit the Release Notes in the Community Wiki. As always, we plan and prioritize new features and bug fixes based on your input. So keep your suggestions coming! Simply follow the instructions on the Reporting Bugs and Providing Feedback After Go Live page and we’ll continue to build a better SAP Community experience together! You need to get the email notifications working again as a top priority. Without them the lifeblood has gone out of the community, and compared to real web sites like Facebook and Linked In, the SAP Community looks very amateur. This is the primary reason the number of “views” on virtually everything posted has dropped like a stone since the migration to the new platform. You can add all the new features you like, but if 90% of people have stopped visiting the site it does not really matter. Sorry to be so negative, I know you are trying as hard as you can. As you can see here, email notifications are expected to be released in January. I don’t care for email notification, and never did. I know it is important to a lot of people, so for sure, go for it! …just wanted to share my take on it, as I seem to be the only one with that opinion. Thanks for sharing your thoughts, Joachim! Please note that email notifications are being rolled out as an opt-in feature, so if you don’t want them, you don’t have to use them. Great Job Jamie and the whole Communityteam! (Too bad I can’t @ mention anyone in the comments … hopefully someone added that as a feature request in Ideaplace ). The direct primary tag assignment in a question was much needed and will help first timers and newcomers easily ask a question. Can we add a similar link to all our tag pages and CTPs? Both @mentions and extending the pre-filled tags concept are on our wishlist for future development (some sooner than others). I’m happy to share details on that as they get closer to being rolled out. Thanks for your comments – it’s always good to know when we’re on the right track! I hope this easy feature can be added soon! Today I used the “Ask a Question”-Button for the first time. It worked, but I think to me there was no benefit over just creating the question “from scratch”. The only thing that button does is pre-fill the primary tag (an in my case, it was wrong(FIN) anyway, so I had to manual change it). I also added the link to the original question myself, maybe this is something that button could do automatically? I do admit, though, that to a new user this button might be helpful, as it is easily visible, viewing a way towards the next step.